Side handles enables carrying like a suitcase. Sling straps on the sides enables bag to be carried on one shoulder like a sling-bag. 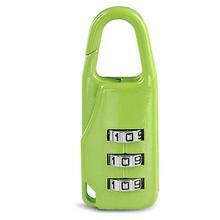 Bags can be pad-locked, preferably with combination locks, shown above. Keys are sometimes lost or misplaced. 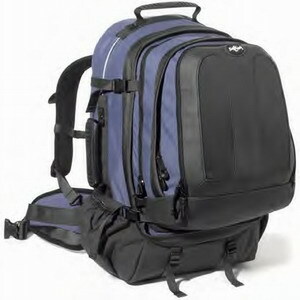 Has good padded backpack straps for carrying on both shoulders with padded hip-belts. These straps can be stored or zipped up neatly at the back for easy airport handling and checking in. 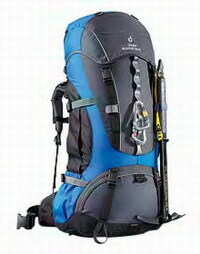 The small day-pack is usually detachable from the main pack. Camping Backpack features flap-down cover and access if from the top which means having to dig into the bag to get to the bottom contents. There's only one-way to carry comfortably i.e. both shoulder straps on both shoulers. Bags cannot be pad-locked presenting a security problem. Excellent padded backpack straps and hip-belts but are left dangling from the bag at all times.